Here we see Western Greyhound's Volvo Olympian S455 ATV on the lengthy 510, from Newquay to Exeter. 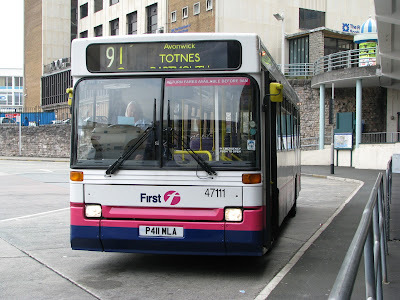 The journey takes the bus 3hrs 30minutes, leaving Newquay at 13:05 and arriving into Exeter at 16:35. The last time I used this service I had a Mercedes Citaro, replacing the Volvo due to operational reasons requiring the Citaro to be moved up to the Bude depot for the next day's work. The Olympian performed faultlessly over the 2 and a half hours I spent aboard her up to *Launceston before switching to the 576. These Ex Nottingham beasts really do have some power and they really do perform surprisingly well. Of course the gearboxes have a fairly low ratio so speed is not a key element, but they certainly can go along some of the twisty narrow roads of West Cornwall. They certainly feel much more agile than the Citaro I did the journey aboard in 2009. 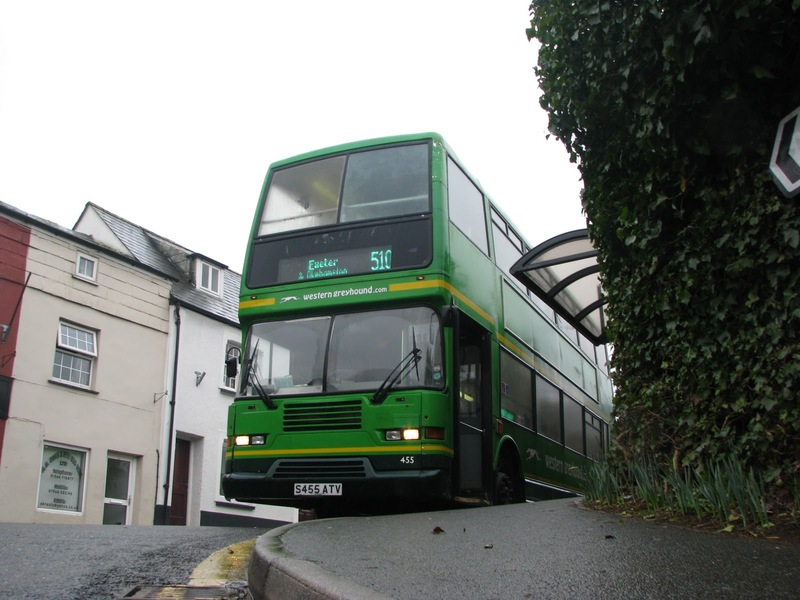 S455 is pictured here in Okehampton resting before continuing the journey to Exeter. 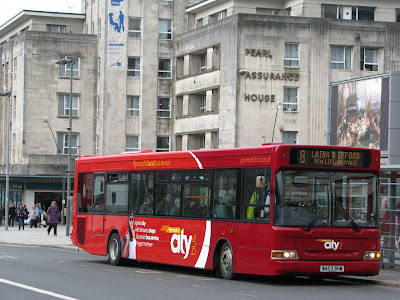 The New Plymouth Citybus livery! Now there has been a lot of interest in this new livery Go Ahead have applied to Dennis Dart 67. I better start with my view though. I certainly think the livery is very smart and modern, is really does look professional, although the curves of the livery simply do not suit the 'boxiness' of the Dart, or any other bus body for that matter! The front red is also somewhat too dark, the red used to the rear contrasts with it a bit too much. Possibly in reverse order this would have been better as Omnibuses pointed out. Though unfortunately we really cannot hide the fact that the livery is just that bit too similar to the Oxford Bus Company's livery. It has also been likened to Southampton's Uni-link service, which uses the same sort of pattern, but with a different color scheme. The colors are just far to close to Oxford's, and it just has that air of 'what was left in the shed' about it. I by no means am disputing that its smart, but we were 'promised' something individual and in keeping with the city. It has been mentioned that at least red has been retained. But actually, if you think back through PCB's previous liveries a 2 tone red has never been applied, unless someone can correct me. It has always been block colors of white, red, grey and black. Of course if you were being technical the old Countrybus livery applied to the LHs in the 80s(?) included a cream base. It is also true that the company is now of course part of Go-Ahead and that we should 'expect' something more corporate from the company. But looking through all of the other subsidiaries, no 2 are really the same, so its a shame the individual trend hasn't been fully carried forward. The new PCB logo also doesn't show individuality as has already been discussed. The logo is again much like Oxford's, as is the new website. 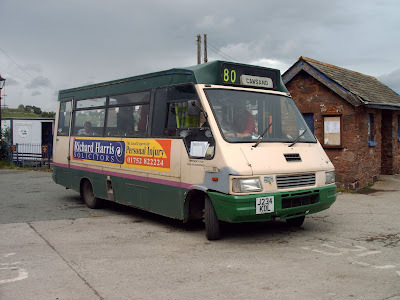 Of course as was presumed, this livery is the work of Ray Stenning and his team, and this is why the livery can also be linked to Trent Barton's Red Arrow livery seen on its coach service from Chesterfield to Nottingham. Another point many people have raised is that there is now no room for advertising by other companies, unless they opt for an all over wrap of the livery. A potential loss in revenue here which we hope won't be passed on to the customers. Another thing I picked up on was the complexity of the livery. If a panel was to be damaged and was in need of replacement, it would be much harder to match up with the rest of the bus, and if left unpainted, would completely spoil the lines of the livery. The livery though smart now, could begin to look tired and 'battered' very easily. The 'old' livery, though simple, suits the lines of every bus in the fleet, and leaves it very easy for panel replacement and retains plenty of room for advertising. It is also quite a traditional and basic livery, and I must admit, I do favor this! The particular example I am referring to in this case will be Go Ahead's Wilts and Dorset livery. The old livery was very smart, with clean cut lines, and retained some traditional values. The new livery seems a bit drab, and messy and personally I've never liked it. Again we see the use of a similar shade of red though thankfully it is less intrusive on the natural lines of the bodywork, particularly on the Solo. The two liveries can easily be compared with this photo I took during the transition period in 2008. Its certainly a heated topic, but we shall see how the livery matures over time, and how it will look on other members of the fleet! Its a shame that none of the Step Darts or 709s will make it into the livery (At least I highly doubt it! 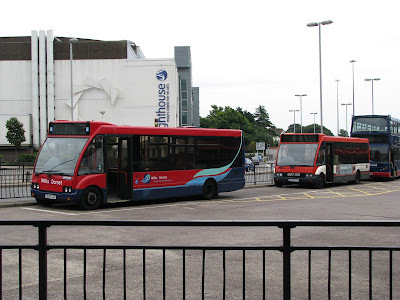 ), but at least like Birmingham did with the MCW Metrobus, we will easily be able to distinguish between a low floor and a high floor bus, ensuring passengers could easily identify if they would be able to use a service before flagging it down or attempting to board. Yay, I've found a positive note to end on! the currently in fashion "lifestyle" vinyl. Must have been about an hours work for him." The joke's on me this time! A-Line's Steve making a mockery of me! Very clever! A-Line's newest addition to the fleet, R260 GNJ, has been used in service for the first time today. This Iveco 59.12 from Heron of Crawley, affectionately known as 'Ivor' in the A-Line fleet, has been with A-Line since November, but has so far been relegated to the school runs only. Though due to the non-availability of both of the Mercedes Varios, she was pressed into service on the 80/A/B throughout the day. 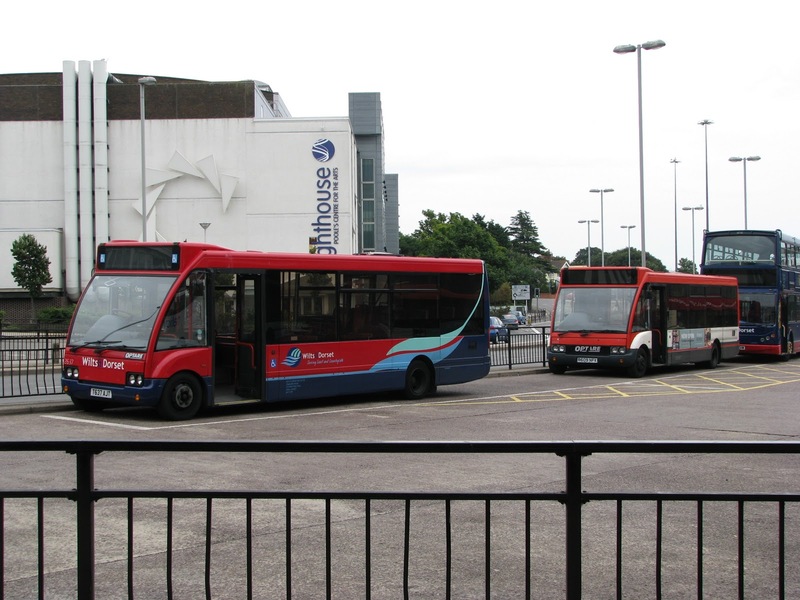 Some of you may remember that A-Line used to operate two other Ex-Southern Vectis Ivecos, J234 and J238 KDL, which were subsequently replaced with M152 LPL and later the two Varios. 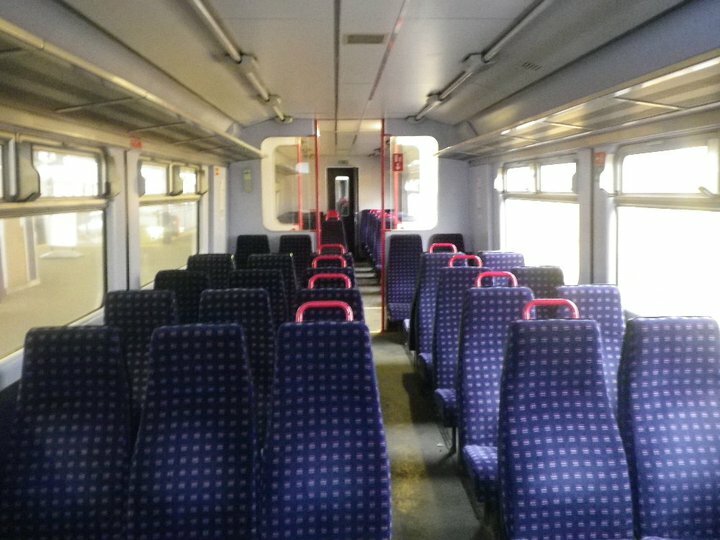 So its been quite a trip down memory lane for passengers on the service today. She is somewhat 'tired' in her appearance, though this has to be expected for a vehicle which is fast approaching its 400'000th mile since new in 1997. The engine certainly pulls well, though is understandably more sluggish when compared to the previous Ivecos, thanks to its heavier Marshall bodywork. The interior is certainly very smart with high back coach seats in very nice condition.I've also very much enjoyed the manual gearbox, its just so much smoother than the Alison automatics, along with it being much more interesting when observing the driving. Steve - who drove the bus to Trago today with his girlfriend on board was somewhat agitated by the fact that his usual very professional driving, was lacking today after not being used to the manual, especially it being his first time driving the Iveco. In his attempt to 'impress' her with his driving skills, he made a bit of a hash of the gears on multiple occasions! He couldn't complain enough about the Iveco, and in fact ended up kissing the X reg Vario, when he got passed it before working the evening 80s, along with shouting "I love you!" to Jim! So all in all a successful day with many compliments from the passengers on board, if not from the driver himself! But with the Iveco being able to do 20mpg (8 more than the Varios! ), Ivor looks set to be at A-Line for a fair time into the future, and I certainly look forward to the next time both Varios break down! In the few moments of sunlight we had on Saturday I managed to grab this photo of 34197, one of the Ex-Airbus Volvo Olympians, still playing her trade down in St Austell, working into Truro with the church in the background. These were brought down here several years ago now for use on the X80, though these have since been replaced by Dennis Tridents. The Olympians are still fantastic vehicles to ride on, the engines have always been very good on them and the high speed gearboxes sound wonderful! Amazingly these are actually disabled accessible thanks to a lift being installed to the step on the entrance to allow it to be lowered down to the curb and then raised up to floor height. A very simple but effective system, and its a shame that other high floor buses couldn't have had this fitted. I could just imagine a simple system like this prolonging the lives of many VRs, Olympians and Atlanteans. But I can only dream! I shall air my views on the new livery at PCB in due course when I get a photo, but for now we have some much more interesting news to deal with! 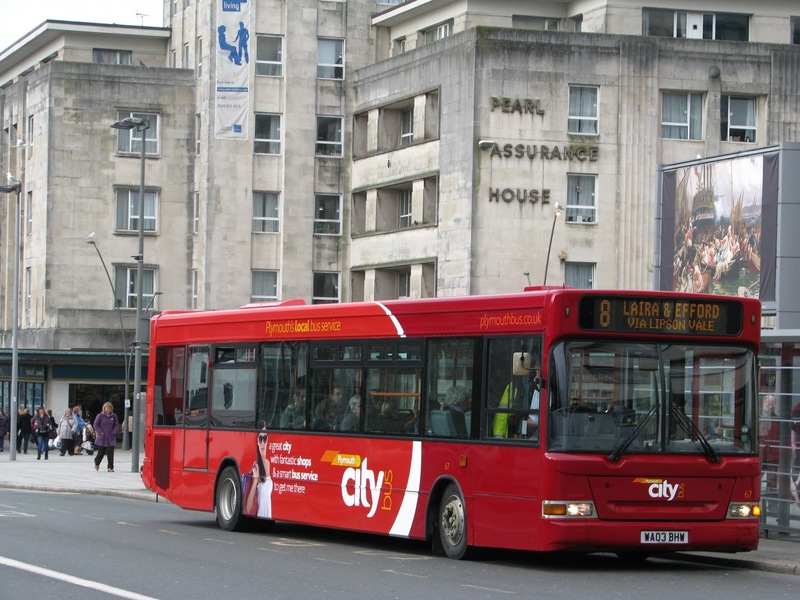 Plymouth Citybus has just announced the service changes for April, seeing several major changes along with a few minor parts, in general tidying up of some routes. The biggest change comes with the loss of both services 46 and 47. 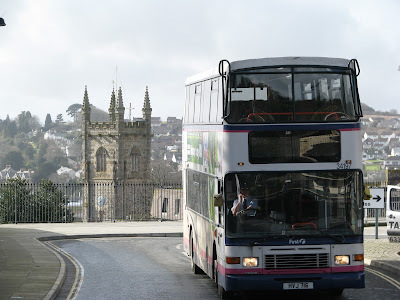 These are both of course long and well established circular routes operating a lengthy service serving many different back roads on their way through St Budeaux, Ernesettle, Southway, Derriford, Estover, Leigham, and Mutley Plain. This has been described as a lifeline countless times by regular users and it is a shame that PCB have regrettably had to withdraw the service due to lack of funding from Plymouth City Council, which did look inevitable anyway. I must admit the times I've used the services while chasing step entrance Darts around the City, both routes have carried a fair load for the journey. Obviously though the numbers don't add up, and a reduced service now seems off the cards. Its not all bad on this front though. 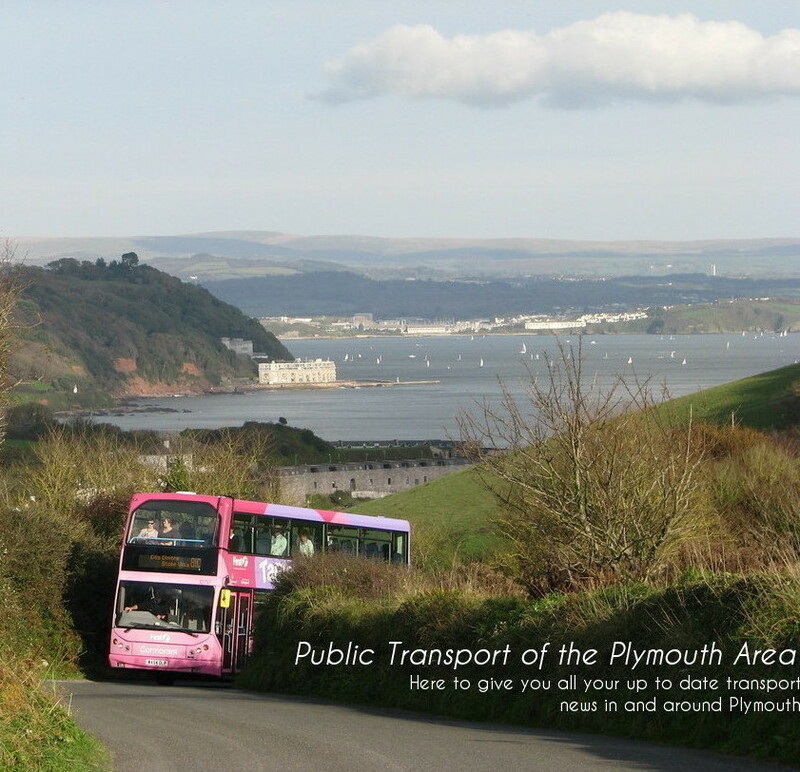 As a partial replacement; the new 27 is being introduced to cover the route between Deer Park and the City Centre, going cross town by then going down to Devonport and Stoke, terminating at the Torpoint Ferry. Cross City routes never seemed to have worked particularly well in the past, which is of course why FDC took the decision to simplify the complex structure and simply start and end all routes on Royal Parade, which as we have seen, has worked wonders for passenger growth on many of the routes. I'm sure PCB will have done their homework on this though, but they certainly go through 2 areas of potentially heavy congestion, so hopefully timetables will have been written accordingly. The rest of the changes are generally a bit of 'housekeeping', apart from the 45 which will see its remaining section from Royal Parade to Cattedown cut. Of course last year we saw the Devonport section cut, but now the route will be totally removed, leaving the Solos available likely to see off the olde faithful 709s completely. 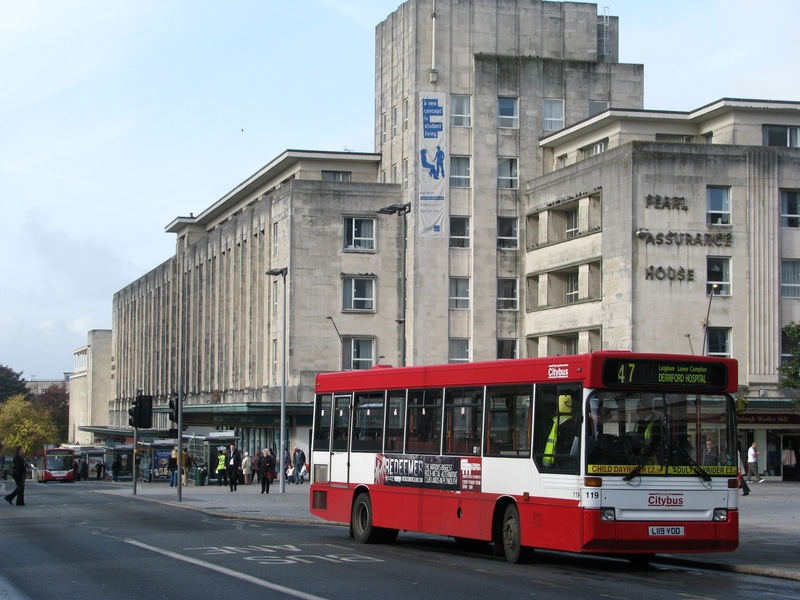 20 will be removed from Merrafield and will instead terminate in Mudge Way. 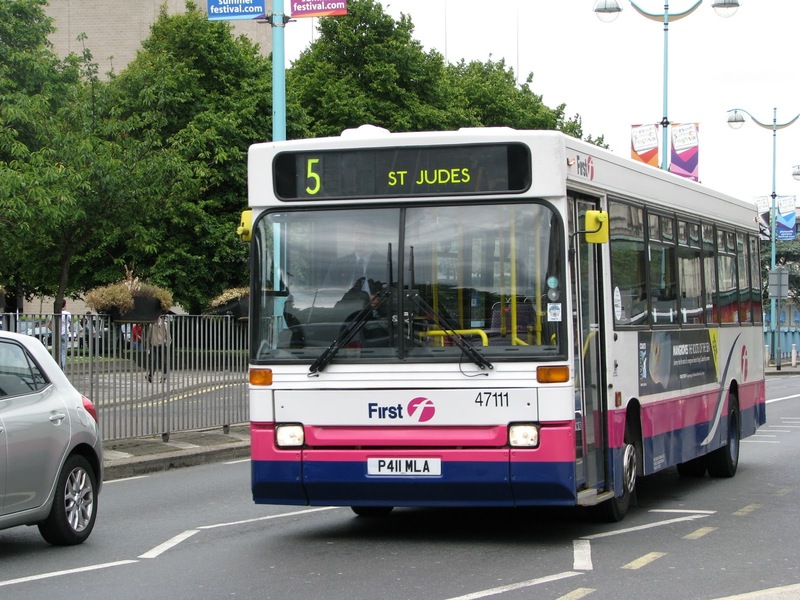 The 42 will be brought into line with the Sunday only service missing out Leatfield Drive, because of traffic issues, hopefully improving the reliability of the service overall. 40D and 41D will also be withdrawn and replaced with standard 40 and 41s. So overall the potential impacts have been minimised by some careful planning, and cuts have of course been inevitable since the take over of Go Ahead, but I must admit, through all this moaning from passengers I will say I have been very pleased with how few reductions we have seen so far. Really they have done what they set out to do which is streamline the services to make them more efficient, introduce more low floor buses (more low floor deckers due soon!! ), and generally modernise the company. 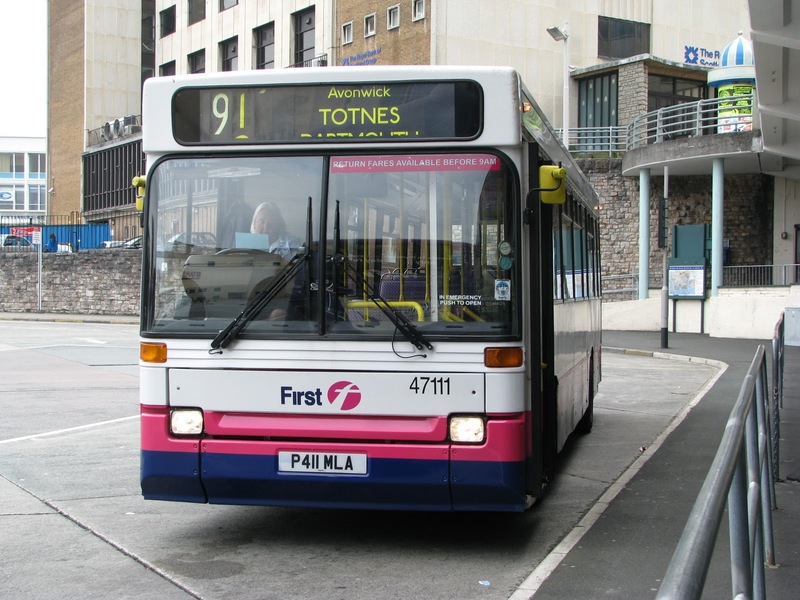 Under another company we could have seen much worse, and Go Ahead certainly seem to have proven themselves as the bus company of choice for Plymouth! It was very pleasing to find that Ex-Plymouth Dennis Dart, P411 MLA has been secured for preservation. 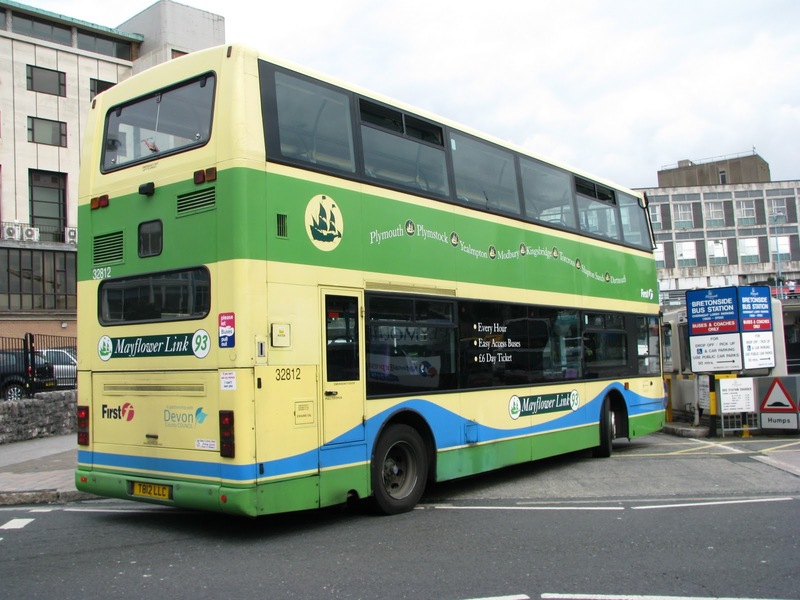 While browsing through I came across this website from the Bromley Bus Preservation Group who now own the Dart and are restoring it to the condition it was once in while working for its original operator, Centrewest. 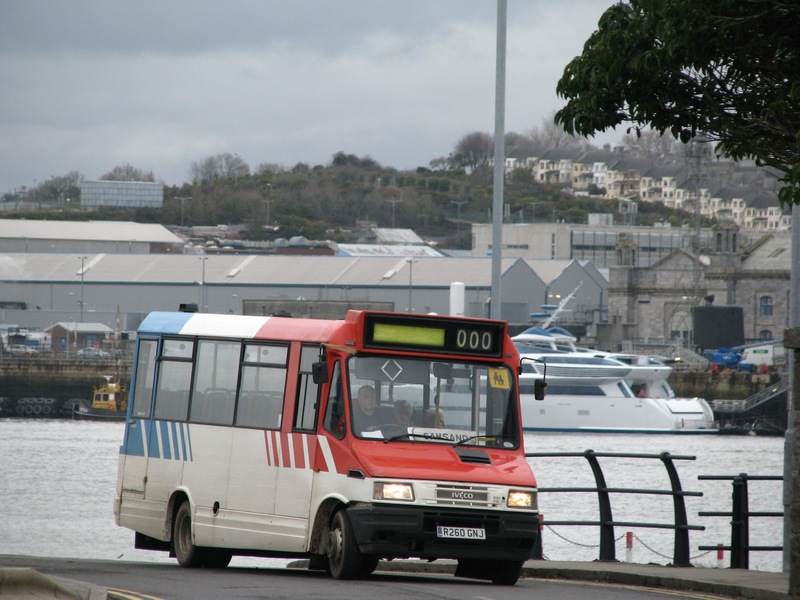 Of course the Dart made regular appearances on a variety of different routes in the city. Its usual haunt was the old 91, but it was by no means uncommon to see it out on a variety of Ugobus tasks. Really good to see and the best of luck to the BBPG in keeping this bus running for many more to enjoy! Please click the link below to browse the bus' progress in preservation. Following PCB, A-Line Coaches has now had its website professionally done by James Anderson at Reddex Designs. James is a student alongside myself at Devonport High School For Boys, and I must say, looking at his work he, he is very capable! He even won the Herald Young Entrepreneur of the year in 2010. The new website shows of many of A-Lines attributes and now looks very modern and up to date. Derrick Cuff hopes that this will bring much more trade into the company, which it has already been succeeding in doing. The photo galleries have also been added to show fleets past and present including my own and Derrick's photos throughout. With thanks to Tom Pearce I can bring you these great photos of LR02 LYU, the first of this batch to be put into the new improved Mayflower Link livery. I did fear this would be lost, along with the T-LLC Trident's departure down south, but thankfully the livery is making a return. I must admit, against many people's views, I'm all for branding, as long as its done well. 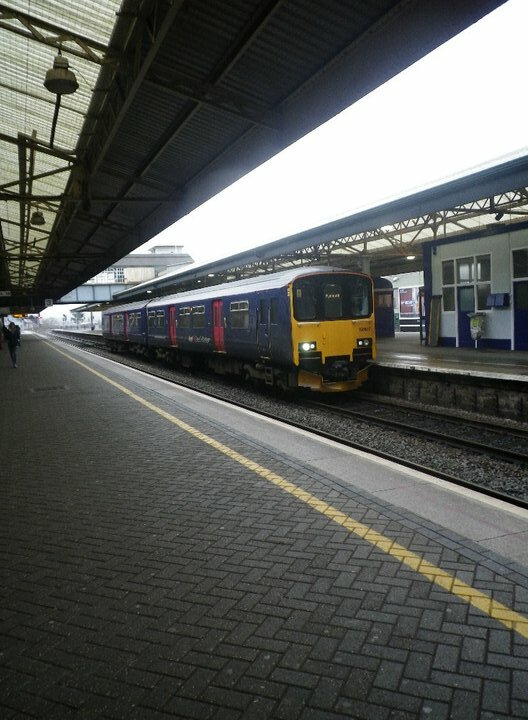 Of course the old Blue Line, Purple Line etc that used to be used in Plymouth did very little for the image and gave the public very little to take in and take note of. Tamar Link, the first 'proper' branding to be applied worked a treat. How in the world could you ignore a big pink brand new bus? It did the job perfectly even if the livery can be controversial, but weirdly, it does grow on you! 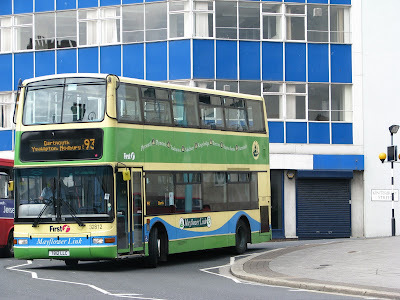 The Mayflower Link 93 livery though has been by far my favorite branding that any company has used, let alone FDC. The colors are, simple but bold, and tie in perfectly with the scenery, through the medium of wave like blue streaks down the side and green underlay. Truly magnificent. There are some slight changed to the old livery in that the font for the main writing has changed slightly on the front panel. There is also the addition of more green to the rear, and the blue wave now continues right up the back of the bus to support a new ship logo, very smart indeed, though the green may be slightly excessive, though I'm sure it will look better with a bit of fading after a few months! I have included some photos of the older version of the livery below for comparison. With thanks to Stuart Broom, I am able to bring you these great photos of FGW's newly painted 150127. This is one of several that have entered work mainly from Exeter TMD, to begin to replace the Class 142s. Of course 142009 has been repainted and will join the Northern fleet after its spell down here at FGW. You will notice that this repaint has not seen the 'neon waves' with different Westcountry locations re-applied to these 150s, but which are still seen on out more 'native' 150s. I've been told this is mainly to keep costs down, and is due the fact that they used to get dirty quite easily, and therefore a darker base colour has simply been used throughout. 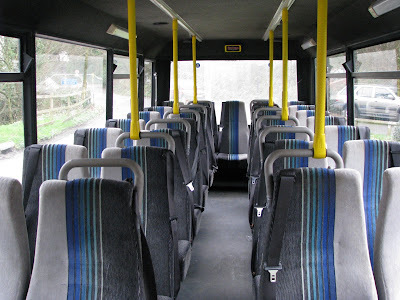 Good news for travellers is that the 3+2 seating has been retained with their very nice high back seats. Though the legroom is somewhat compromised, at least your pretty much guaranteed a seat, where as on a Pacer, often there is only standing room available. These have now been very nicely re-upholstered and the trains are looking very much fit for service, for the next stage of their lives.